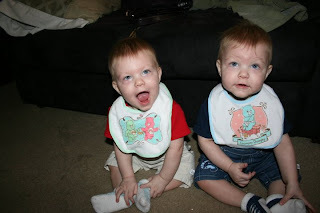 In the picture Thane is one the left and Xander is on the right. Okay. So it's been a little over a month since I last blogged. It's gotten so hard to blog now that the boys are finding themselves more mobile. They now know that they can get places quickly by pulling, scooting and rolling. And they are now pushing themselves up on all fours so I don't think it will be long before they figure out crawling. Both have now managed how to sit up from being on their bellies on the floor all on their own. I've also started to become a little more laid back when it comes to parenting the boys now that I see how big they're getting. (at least when it comes to food....) I finally just handed them some crackers to sit there and eat. (I've been to paranoid to give them things like crackers but they keep wanting to chew their food.) They now eat food like they have never had to have pureed food or bottles ever. I think it helps that they have 4 teeth and a fifth one coming in. (they are doing pretty good at tandem teething.) I am going to be moving soon. (In about a week) The boys and I will be moving in with my Fiance. I'm excited and nervous and it will be a big adjustment for the boys. I've been rambling about things and not even staying to one topic here but I felt I had to fill in the blanks of the past month. Over the past week in specific I took the boys to visit their father. It's going to be hard for him to adjust to the boys and I living with him but we have talked to each other and are going to work together on things. The boys both said Dada for the first time while we were there too!! I got three trips without the boys while I was there. (not happy about how they were taken care of during one of my trips...they weren't taken care of at all. On the bright side that trip was only a 30-45 minute trip to the store...and I now know who will never watch the boys again.) During the trip I also got a few new things for the boys. It was a long week but it was very eventful.